﻿ Jujubee S.A. - Games Developer and Publisher. 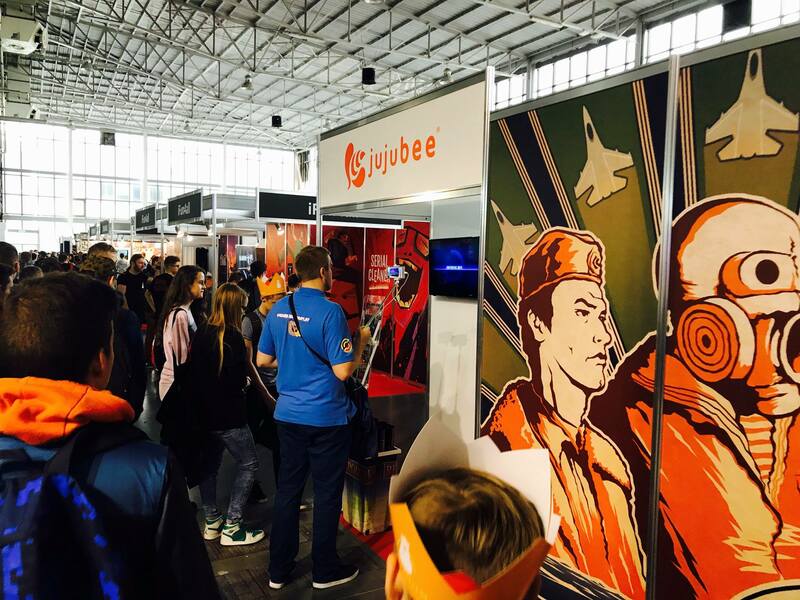 iOS | Android | WP | PC | Mac | Linux | PS4 | Xbox One - Jujubee at the Poznań Game Arena 2017 conference! The tradeshows we had the pleasure of attending this year were ripe with an abundance of exhibitors showing their freshest games and other products to a broad audience, as well as media and business partners. After returning from the biggest event of its kind, Gamescom 2017 in Cologne, we decided to wind down and begin preparing for the next challenge – our native Poznań Game Arena 2017. 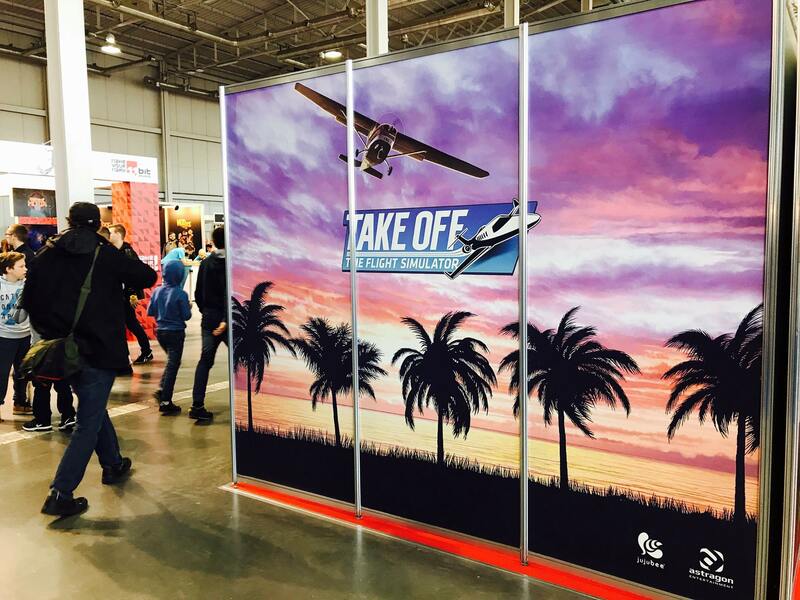 A few years ago, PGA became the biggest trade fair event, not just in Poland but across the whole of East-Central Europe, and it’s still going strong – 2017 marked its twelfth edition. It is for this reason that all the Polish game developers, the well-known as well as the smaller independent ones, come to Poznań and show off the fruits of their labor to gamers and the media. This year, our studio focused on press meetings and talks with potential business partners. During a closed presentation for media and business agents, we presented the pre-release, playable version of our flight simulator Take Off – The Flight Simulator for the PC, which had its public premiere a few days after PGA – 10th October 2017, to be precise. 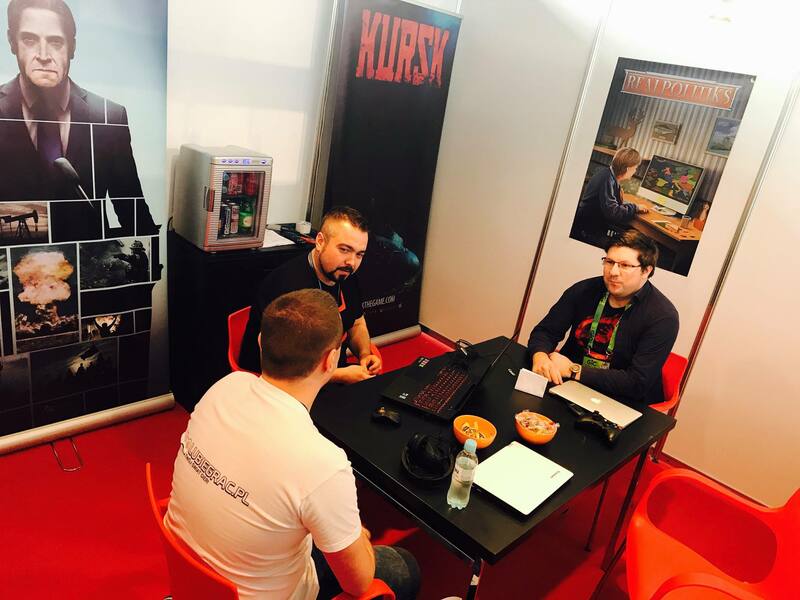 Representatives from media and game-related companies also had the opportunity to learn more about our upcoming games KURSK and Realpolitiks, as well as our other plans and projects. “For the past months I have had the pleasure of following the growth of KURSK, and I can tell how much work has been put into the game for it to capture the atmosphere and character of Moscow and the much smaller Vidyaevo, as well as the submarine itself (which is absolutely fantastic and has been made with the utmost attention to detail). Every element is meaningful, and the gameplay can unfold in many ways. (…) The makers deeply care about the graphics (…) I have seen KURSK with my very own eyes and am pleasantly surprised with the meticulousness and overall quality of the visual aspect of the game. At this stage of production KURSK certainly surpasses some of the bigger productions in that regard”. – Maciej Zabłocki, head editor of PC LAB. “What I saw at the presentation was a very early version of KURSK. Last year during PGA, the title was available for playing, but since then it has changed drastically. (…) The makers are most certainly men of their words and are trying to copy the realities of the catastrophe to the best of their abilities. The clothes, as well as the harbor, seem to check out, and the interior of the ship has been recreated as meticulously as is humanly possible. What’s interesting is that Jujubee even decided to check what the weather was like when the vessel set sail (…) What we saw at this year’s PGA has given us really high hopes for an interesting title. We’ll be able to tell you more about the game when we actually get to play it, but that’s most likely to happen later – closer to the premiere date”. – Michał Hawełka, editor of Polskie Gry Wideo. Many of the meetings were held in a friendly atmosphere. We often let go of an official tone, in favor of a more open and affable one. This was all thanks to the spirit of PGA, which had an impact on the exhibitors and visitors to the independent games zone, as well as everywhere else. The chance to see over 130 home-bred titles, which filled the halls of the Poznań International Fair, was an amazing experience. 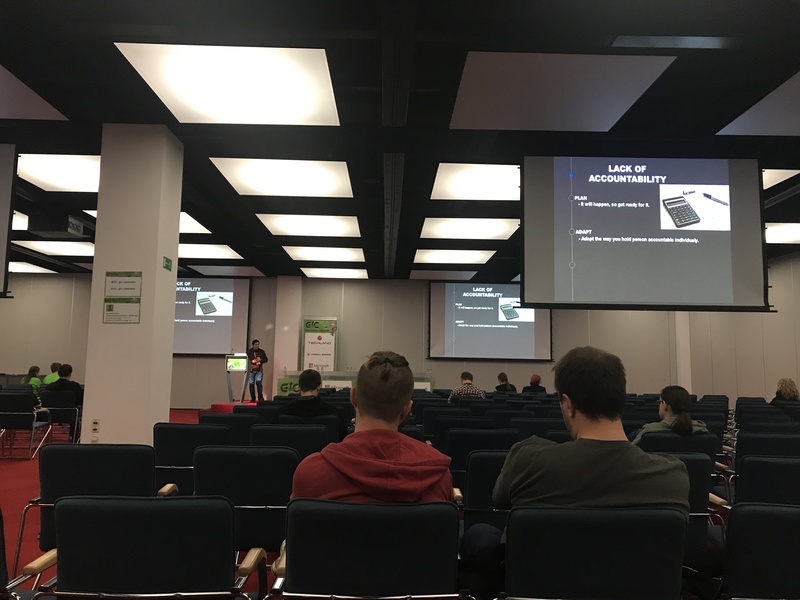 It also showed just how much stronger the Polish game development scene has become, and it is clear that events like these help to propagate talent and productions from our developers. The PGA trade fair doesn’t just boast game presentations. Barring that irreplaceable element, most of the halls hold hardware premieres, e-sports tournaments, YouTuber meetups, cosplay contests and presentations in the retro games zone. The Game Industry Conference, an almost obligatory event to attend for every game developer, is a conference filled to the brim with highly educational talks about design, technology, marketing and all other aspects of game production and promotion, where you can meet some of the most important people from the games industry. During this year’s edition of GIC we had the opportunity to speak for the very first time. Our producer – Damian Kocurek, was able to share his wisdom and experiences regarding the development and management of a production team. We hope that the information he shared during this interesting talk will prove useful for those who were focused and engaged the entire time, listening to every single bit of advice. Just like last year, PGA can once again be proud of its amazing attendance. Estimates suggest that over 70,000 people visited the 10 exhibition pavilions. The 28 hours of tradeshows were once again in great demand, and even the horrible weather conditions couldn’t discourage exhibitors or visitors from showing up in Poznań. We are positive that next year’s event will bring even better results, and we are already looking forward to the next edition of PGA. We will be there once again to support our native market and promote our productions to enthusiasts of electronic entertainment!